We are a family-run Chinese supermarket and cash & carry in Bristol, UK. You can buy our oriental ingredients and goods online! We deliver direct to your door across much of Europe, so no need to leave the sofa! To start shopping in our online store, select a category below. 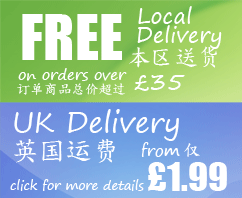 With over 3,000 products, we have one of the largest ranges of Chinese and Oriental ingredients online. We have even more in-store, so if you're in the area please come and visit! The cuisine and culture of the Far East is as rich as it is varied! We have put together some articles and recipes that we hope will help you discover and enjoy our culture. For details of upcoming events and offers in-store or to find out what the press is saying about us, keep an eye out on our news & media pages.